This post marks the second in a series of essays – posted the second Wednesday of each month – by Alan Corbiere focusing on Anishinaabeg participation in the War of 1812. At the commencement of the War of 1812, the British were not totally certain that the Western Confederacy (including the Anishinaabeg: Ojibwe, Odaawaa and Potowatomi) would fight alongside them. The Western Confederacy had lost confidence in the British at the Battle of Fallen Timbers in 1794 when the British had abandoned the Anishinaabeg at Fort Maumee. The Anishinaabeg and the other members of the Western Confederacy had to face the Americans on their own and were slaughtered. At subsequent councils the Anishinaabeg reminded the British of this betrayal. The British knew that they needed the Western Confederacy as allies, but they also knew that trust had been broken and actions would have to replace words. So when Captain Roberts, Commanding officer at St. Joseph’s Island, received a second letter from General Brock advising him to take the action he saw most fit, Roberts opted for attacking Michilimackinac because he knew that he had to demonstrate to the Anishinaabeg that the British would fight this time. On July 17, 1812, Captain Roberts with 30 regular British soldiers, who he described as aged and given to drunkenness, along with 200 Canadian voyageurs, 113 Sioux, Menominee and Winnebago, and 280 Ojibwe and Odaawaa, captured Fort Michilimackinac. This first victory ignited the Western Confederacy to war and many warriors came out to fight the Americans. Captain Roberts later revealed that he had learned that a force of Odaawaa warriors from L’Arbre Croche (a grouping of villages south of Michilimackinac) had landed at another part of Michilimackinac and watched from that vantage point. He alleged that this force was to wait and see how the battle was going, and then join the winning side. Clearly the mistrust was on both sides. However, the victory bolstered the spirit for war and many warriors proceeded to Detroit. Upon reaching the main theatre of war, the British knew that they still had to court the Anishinaabeg and they did this by making more promises to them. The Anishinaabeg, and other warriors, were told in council not to fear the ball or shot of the enemy because their Great Father would care for them if wounded, and if killed, their wives would become pensioners of the Crown. This promise was made in council but was also ratified by officials at Kingston on 26th July 1813 when they issued the General Order that if a chief lost an eye, or received a wound equal to the loss of a limb, he would receive “100 dollars per annum in money or presents.” Likewise, if a warrior lost an eye or received a wound equal to loss of limb, he would receive $ 70 per annum in money or presents. A widow of a chief was to receive a present of $ 200 in money or goods, the widow of a warrior was to receive a present of $ 140 in money or goods. Mokomanish, with nine of his young men, had fallen upon a party of Americans on the River Wabash. During the fray, in which the chief received a ‘severe wound’ in his knee, he and his warriors killed nine U.S. soldiers and took one prisoner… Mokomanish was praised by the whites for treating his prisoner with humanity, but that his own tribe reproached him a fool for allowing a prisoner who was completely in his power to live after having been wounded himself. Consulting Helen Hornbeck Tanner’s “Atlas of Great Lakes Indian History” we see that the river Wabash runs through the states of Indiana and Illinois and that there were three major battles on the Wabash, including one at Prophetstown on November 7, 1811, the famous Battle of Tippecanoe, which some say led to many Native nations joining Tecumseh. This was an early battle and is unlikely to be the one in which Mookomaanish was wounded. The other battles occurred on September 16, 1812 at Fort Harrison and on the “Wabash River.” It was perhaps during one of these two battles along the Wabash River that Mookomaanish engaged the enemy and distinguished himself. 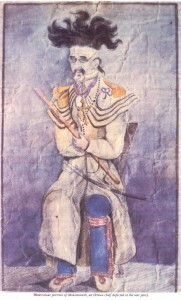 The portrait of Mookomaanish above epitomizes the ‘marks of chieftainship’ by showing Mookomaanish with his chief’s coat, chief’s medal with blue ribbon, a gorget on his shoulder, a silver cross around his neck, and the sword across his lap. Mookomaanish, like many other Anishinaabe warriors, had their reasons for joining the war against the Americans. Some say that the Anishinaabeg joined due to Tecumseh’s eloquence and valor, others say that the Anishinaabe were fighting for the protection of their families and land, and others postulate that young men joined the battles out of a warrior ethic. Whatever the reasons, Mookomaanish joined the war and fought alongside the British. He received a wound and understood that he was entitled to an annual pension, as the Anishinaabe warriors were told this before the commencement of the war. Father – I am again requested to speak. This warrior (Mo-co-man-nish) says that you told him when you were playing (at war) with the Big Knives (Americans), the red coats never promised anything they did not perform; you told him that if he, or any of his young men should get wounded, you would give him $ 50 every day (year) for the remainder of their lives. This warrior was wounded in the leg. He would have slept (died) on the field of battle had not chance thrown a horse in his way; he reminds you of your promise; he has a large family and can barely support them. Our warrior has nothing more to say. He will expect to hear pleasing words from his Great Father at Quebec on the subject. Father – I have little more to say. Many years ago when you called upon us to fight side by side with you and not to fear either wounds or death, you promised us that the widows and orphans of our warrior’s should become your pensioners, that those who were struck by the shot of the enemy should, if Chiefs, receive one hundred dollars a year the others fifty. I was one of those, whilst fighting against the Long Knives, a ball struck me and I was unable to walk. My young men placed me upon a horse and conveyed me to my lodge. There are many like me. Father – I am old and infirm I cannot talk long, there are not many steps between me and the grave, grant me, grant us all our pensions and arrears and we may then build our houses and live in plenty the few short years we have left. The Jesuits reported that in 1850 the Governor General visited Wikwemikong, on Manitoulin Island, where Chief Mookomaanish had settled after the war. After dinner at the priests’ house, the Governor General then gave audience to various chiefs. Chief Mookomaanish then took this opportunity to once again make his appeal for his pension. In his “History of Modern Jesuit Missions,” Jesuit historian Julien Paquin wrote that the chiefs “paid him [Governor General] the usual compliments which, however, were marred by some ill timed greedy requests. One asked for a life pension for having fought the Americans in 1812.” Although the chief is not explicitly named in Paquin’s manuscript, he is named in the diary and referred to as “poor Bebametabi” who had demanded “nothing less than a life annuity for the part that he had taken in the wars against the United States.” Once again Mookomaanish was denied his pension. At the first battle of the War of 1812, July 17, 1812, the Odaawaa were initially hesitant because of various British officials’ inability to fulfill their promises. However faced with the prospect of dealing with the Americans on their own, many Anishinaabeg felt they had to side with the British and hold out the hope that they would fulfill their promises this time. On May 13, 1853 Odaawa Chief Mookomaanish died. He, as well as many others, never did receive the promised pension. LAC RG 10, Vol. 292, p. 195674 – 77. 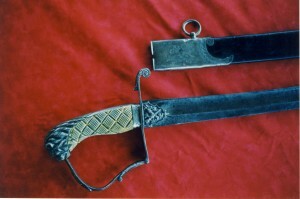 It seems unlikely that Lt Col. McDouall would award a sword to a War Chief for an act that was committed prior to his tenure as commanding officer at Michilimackinac. The exact date of Mookomaanish’s engagement with the enemy requires further research. Journal of Legislative Assembly, Appendix T, Appendix No. 48. Samuel Peters Jarvis Papers, Baldwin Room, Metro Toronto Reference Library, S125 B57, p. 339 – 344. Diary entry dated August 24, 1850, p. 127. Archives of the Society of Jesus of Upper Canada (ASJUC). Wikwemikong Diarium, AJC-CJA, D-0002, S1, SS2, D3-Diarium, Wikwemikong Diaries 1844-1917.